“Cloud,” a public artwork commissioned by Utah Arts & Museums, has been named as one of the 50 best public art projects by the 2013 Public Art Network Year in Review by Americans for the Arts, the nation’s leading nonprofit organization for advancing the arts. 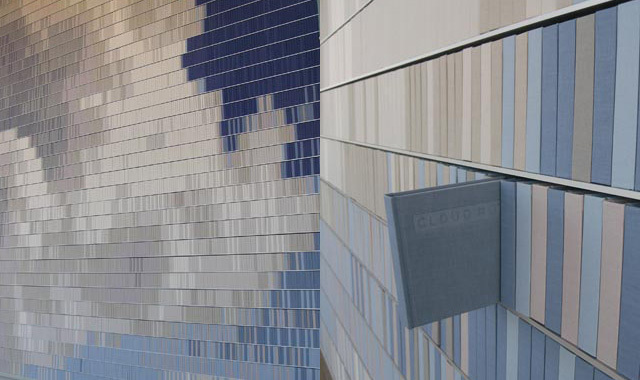 Installed at Dixie State University’s Commons Building, Christian Moeller’s “Cloud” is a large bookcase in which the books’ spines form the pixels of an image of a desert cloud. Moeller’s proposal was selected from 223 preliminary applications from artists nationwide and then from four finalists’ presentations. To make it to the Americans for the Arts top 50 list, it contended against350 submissions from across the United States. With this recognition in mind, we’ve prepared a slideshow of images featuring recent additions to Utah’s Public Arts Program. Check out the photo essay in the July 2013 edition of 15 Bytes.